UTVs have never been better, but the prices of new machines put the vehicles some people want out of their reach. Used UTVs are a great solution. 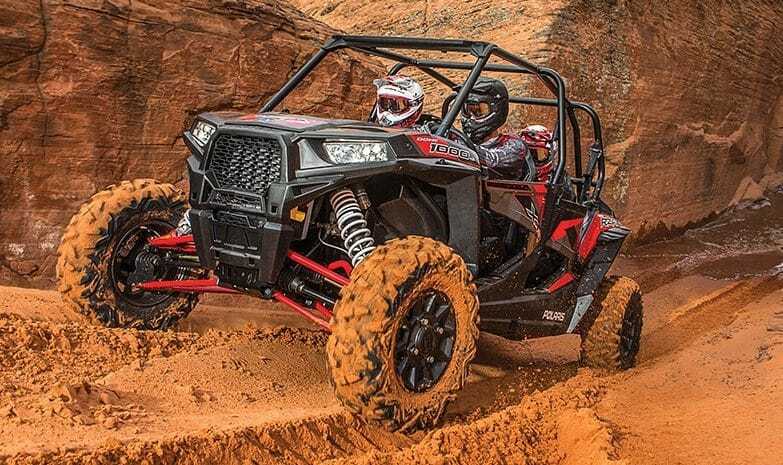 There are good choices in every category of machine, so we gathered the 15 that offer the best performance, reliability and value to help you find the kind of UTV you want and save big. In some cases, you can buy a used model of the UTV you’re dreaming of for half the price of a new machine. Your dealer, Ebay, Craigslist and sites like ATV trader.com have plenty of used machines to pick from. 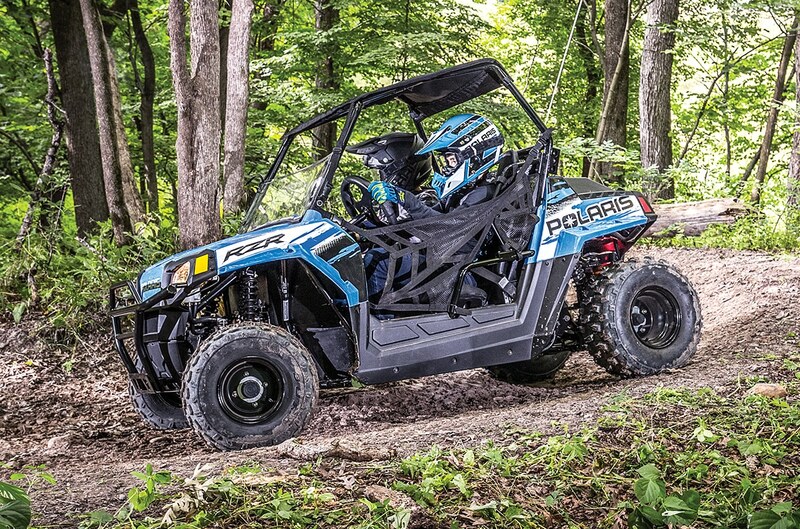 Faster, more comfortable and better built than the impressively fast RZR XP 900, the Polaris RZR XP 1000 became the benchmark for sport UTV performance when it was introduced in 2014. Newer machines have surpassed its performance, but the XP 1000 still delivers an impressive combination of power, handling, ride quality and dependability. There’s a huge selection of aftermarket parts for the 1000 to keep it running well or boost its performance. The 2014 models had belt cooling problems that were handled in 2015, though a clean 2014 can be a good buy if it has the 2015-and-later belt case and cooling ducts. Expect to pay $12,500 to $16,000 for a well-cared-for unit. With about 90 horsepower, the Wildcat 1000 X delivers more power and quicker response than earlier Wildcat 1000s, but it still isn’t a powerhouse among 1000cc sport UTVs. What it lacks in brute power it makes up for with impressive suspension, handling and reliability. The low seating position gives the Wildcat great weight distribution and a planted, secure feel in corners and at high speeds. All models are good, but the Wildcat Limited has fully adjustable suspension, full doors and beadlock wheels. Good examples of this machine can be found for $8000 to $16,000. The four-seat Wildcat 1000 4X has the same 90-horsepower engine as the two-seater, so it doesn’t accelerate as hard as the more powerful sport four-seaters out there, but it’s still plenty fast. A 124-inch wheelbase gives the 4X roomy seating for four and impressive stability, but its length can be an obstacle on tight trails. With fully adjustable suspension, full doors and beadlock wheels, the 4X Limited is the most desirable model. Cared-for 4Xs fetch $10,000 to $17,500. 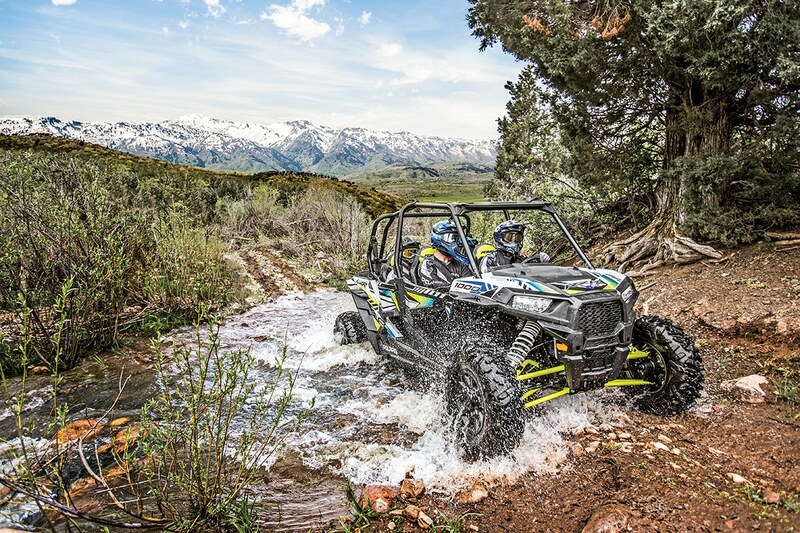 The Kawasaki Teryx has been a reliable, good-handling machine from its introduction in 2008, but the more powerful, comfortable and refined 2014-and-newer models built on the Teryx4 chassis are the ones to look for. 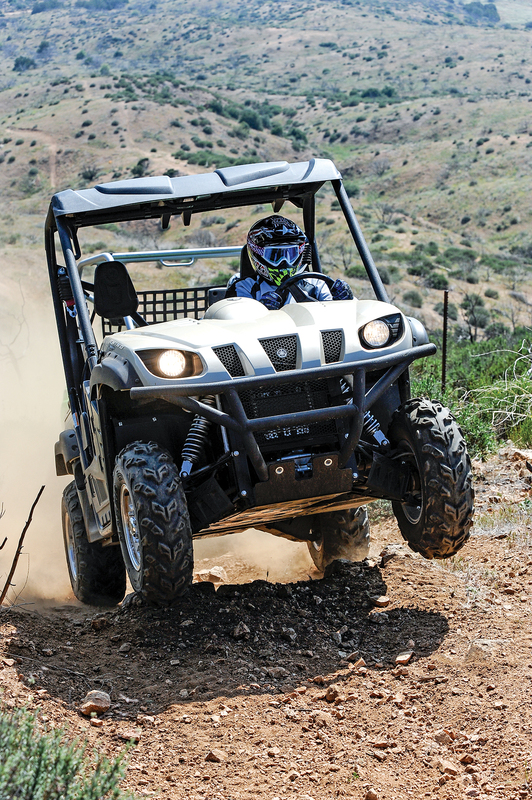 Powered by a 783cc V-twin and having 8 inches of suspension travel, the Teryx isn’t a speed machine but it shines in challenging terrain. Even with long-travel suspension, these machines are compact enough for tight woods trails. The entire vehicle is impressively tough, and the transmission features a sprag clutch that protects the drive belt and provides smooth engine braking. Better examples of this machine go for $6000 to $13,500. 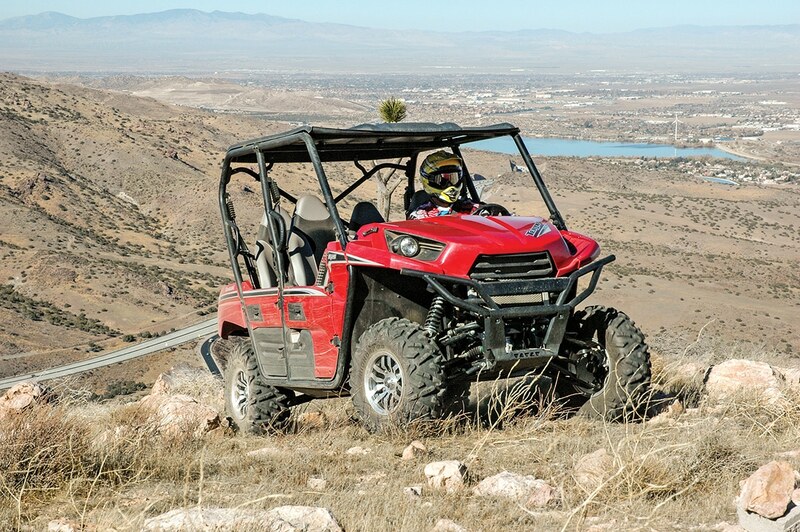 Introduced in 2012, the four-seat Teryx4 came with more power, better suspension and more interior comfort than the first-generation, two-seat Teryx. Compression-adjustable Fox piggyback shocks give the machine a plush, tunable ride and good control for trail-riding speeds. 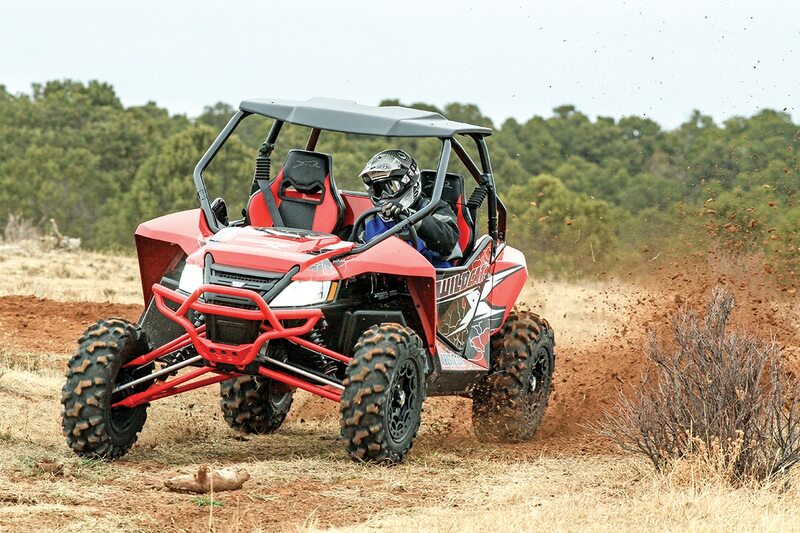 The Teryx4 is one of the more compact four-seaters, so it’s not too large for tight trails. It’s also very capable in challenging terrain, and it’s ruggedly built. You can find a good one for $6500 to $14,500. 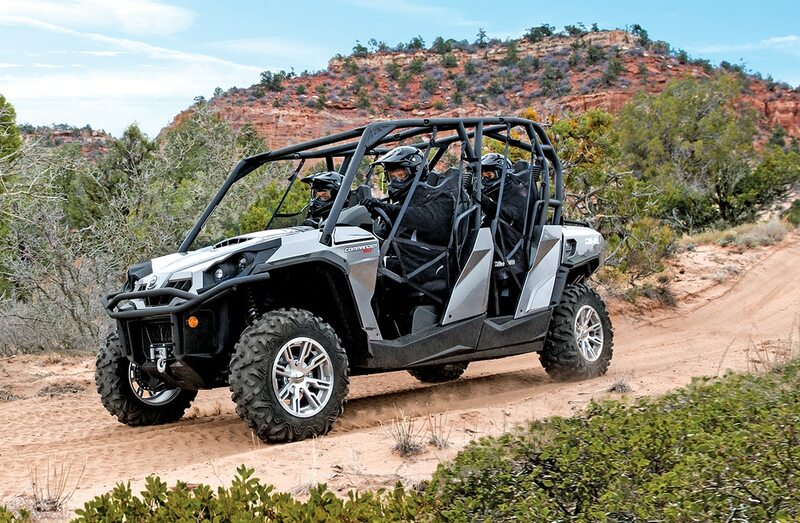 Can-Am Commanders are comfortable, capable recreation UTVs with impressive engine performance and plenty of storage, including a two-level cargo bed. They’re available in several trim levels, and higher-end models don’t cost much more than the base machine used, so seek out the DPS (power steering), XT (power steering, painted bodywork, and winch) or the feature-loaded Limited. Clean Commanders can be found for $6500 to $18,500. 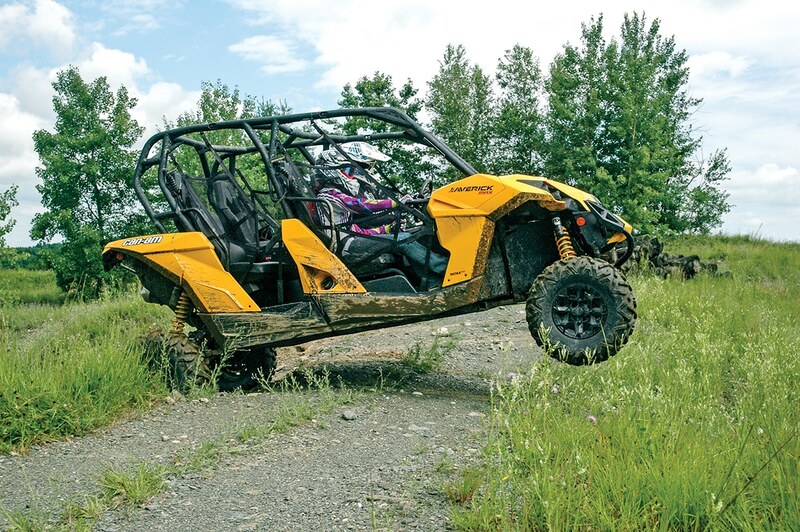 Four-seat Commander Max models join the Can-Am’s healthy power and balanced handling with seating for a whole family. Prices for the better-equipped DPS, XT and Limited models aren’t much higher than base models on the used market, so go for the optioned-up models. You can find these four-seaters for $7000 to $19,500. 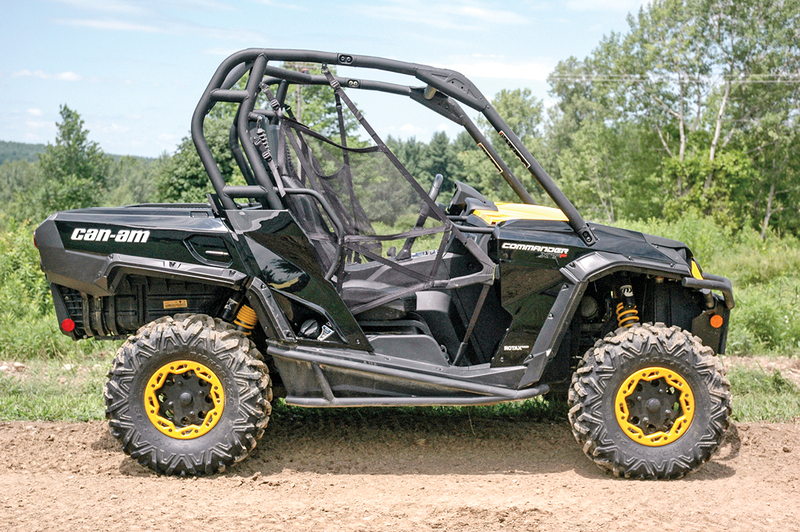 Can-Am discontinued the first-generation Maverick sport UTVs for 2019, because the newer X3 and Maverick Sport have the sport segment covered, but the original 101-horsepower Maverick is a strong performer and a good used buy. The Maverick’s mid-engine design gives it balanced, predictable handling, though it does make changing belts more work. Mavericks were offered in a variety of trim levels and models, including a 60-inch-wide XC version. Look for the better-equipped DPS, X ds or the top-of -the-line X rs models with power steering. Power steering makes a big difference in the handling and feel of these machines. Currently, these machines are going for $6500 to $20,000. Maverick Max models have seating for four and impressively agile handling considering their extra length. 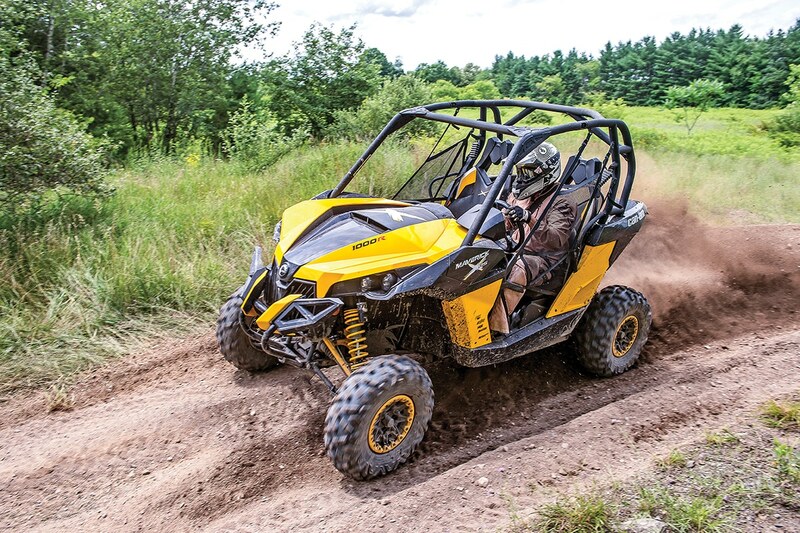 Can-Am’s better-performing X3 Max models have pushed used Maverick Max prices down, making these fast, family-friendly sport machines good buys. Base, X ds and top-of-the-line X rs models were offered all with the same 101 horsepower, so study ads to find the highest-option version at the best price. Prices for these machines go from $10,000–$21,000. 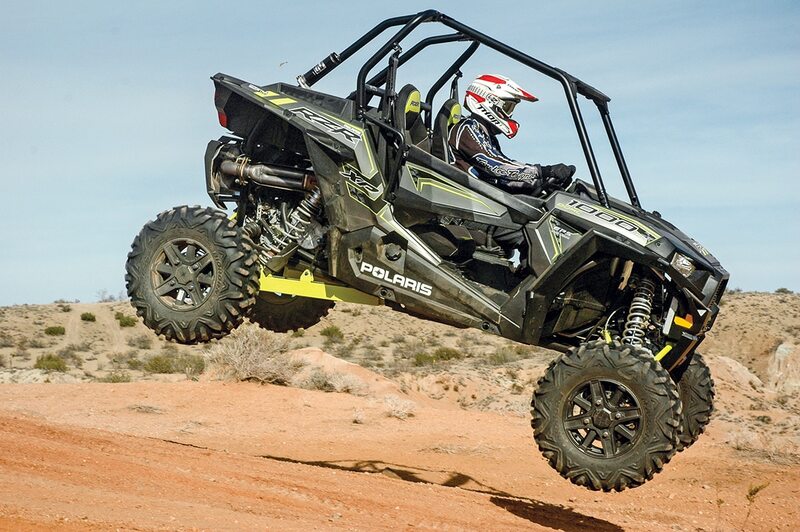 The YXZ1000R joined the solid response and control of a fully manual five-speed transmission to a powerful, high-revving, three-cylinder, 998cc engine in a sport UTV. 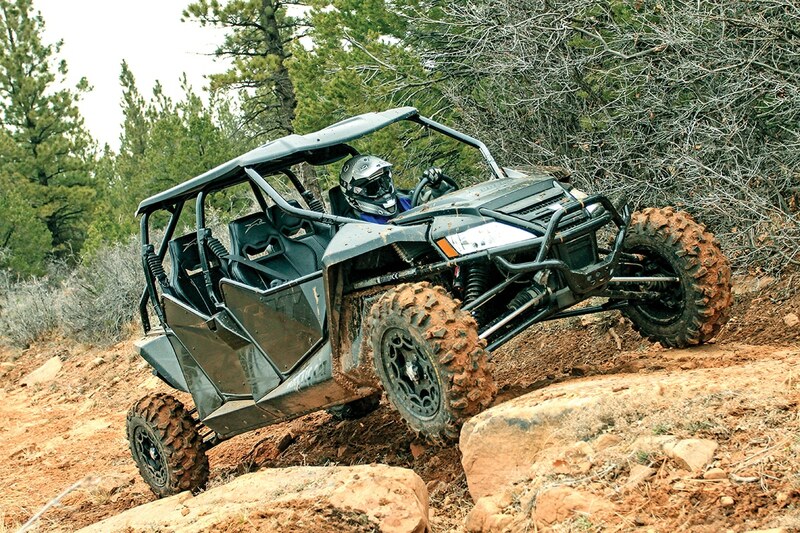 It also brought Yamaha’s impressive build quality to the sport UTV scene. 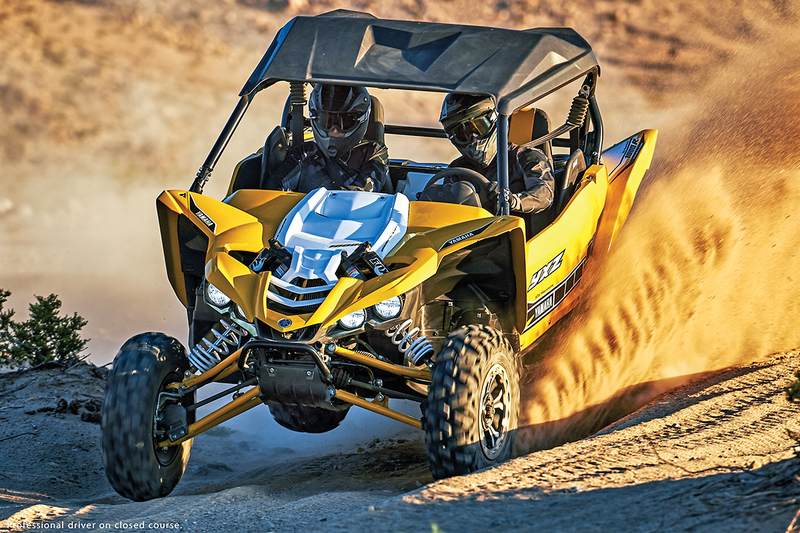 The YXZ1000R’s fully manual transmission, high-rpm power and firm suspension were more aggressive than some trail riders needed, so they didn’t sell as well as expected and showed up on the used market at attractive prices. 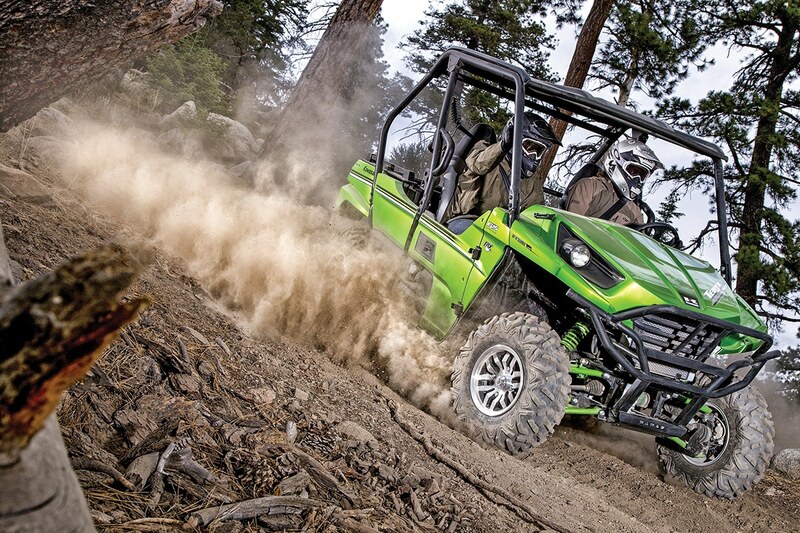 Yamaha made later models easier to drive and introduced the automatic-clutch YXZ1000R SS. You can find clean, complete YXZ1000R’s for $12,000 to $18,000. 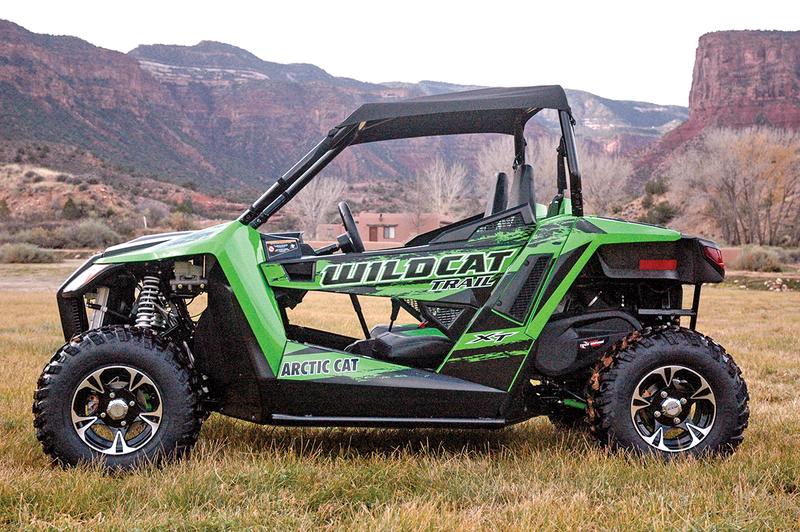 Arctic Cat’s 50-inch-wide Trail 700 was engineered to out-power and out-handle the immensely popular Polaris RZR 800, and it did, though more powerful 50-inch machines from Polaris and Can-Am have drawn attention away from this excellent trail machine. The Trail has a smooth, responsive, 60-horsepower twin-cylinder engine; agile handling; and remarkable stability for a 50-inch-wide machine. The higher-end XT and Limited models are more desirable than the base version, but all are great machines. Expect to pay $5000–$11,000 for a nice one. The RZR 170 got the youth UTV market rolling. Used, it’s one of the best choices due to its simple, solid design and the availability of parts through Polaris’ many dealers. The 2013-and-newer 170s are fuel-injected, but earlier carbureted models work well also. Look for a clean, stock, low-hour example and plan to pay $2500 to $4500. 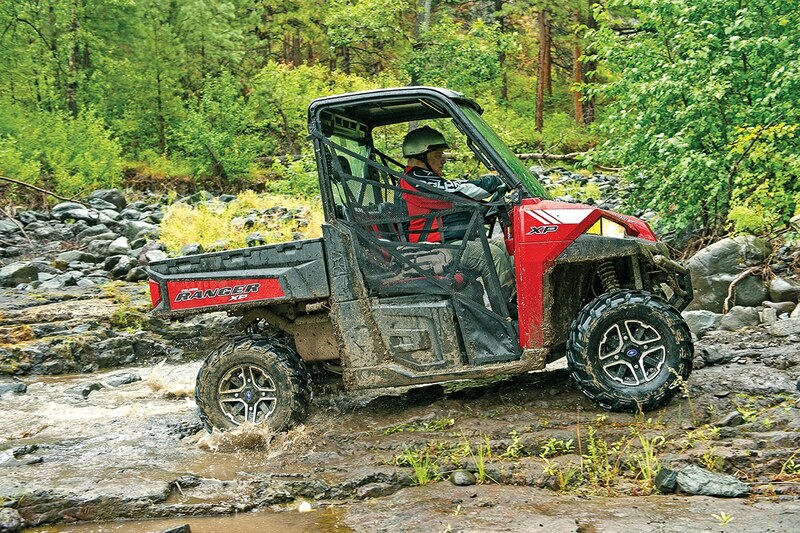 The Yamaha Rhino 660 was a solid, dependable machine from its first year in 2004, but the fuel-injected 700 is more powerful and refined. This recreation machine is great for exploring rugged terrain, and its tilt bed makes it useful for hunting and chores. Many Rhinos were heavily modified for performance, but they’re no match for today’s sport models. Clean, stock Rhinos are the best. Plan to pay $4500 to $8500 for a well-cared-for one.